President Cyril Ramaphosa has appointed advocate Azhar Bham, SC, as the presiding officer into the disciplinary charges against suspended SARS commissioner Tom Moyane. Ramaphosa had initially appointed Judge Kate O’Regan to do the inquiry. "This follows an objection raised by Mr Moyane regarding the links between Judge Kate O’Regan, who had initially been appointed as the presiding officer, and Corruption Watch, an NGO of which she is a board member," the Presidency said in a statement on Tuesday. "While the president is certain that Judge O’Regan would have adjudicated the matter objectively and that her position did not present a conflict, he decided that it would nevertheless be important to remove any possible perception of bias." Moyane’s legal team told the Presidency last week that they will head to court over a technical aspect of his disciplinary inquiry. Moyane’s lawyer Eric Mabuza told Fin24 they informed President Cyril Ramaphosa's office on Wednesday about the intention to challenge the written evidence aspect of the inquiry. The suspended SARS commissioner, who maintains he's innocent of the twelve misconduct charges he faces, insists he should also be allowed to make oral representations. Moyane’s legal team has written to Ramaphosa arguing against the disciplinary inquiry being held in writing, as the SARS Act allows for oral evidence. The lead-up to the disciplinary inquiry, at a not-yet determined date, has been increasingly acrimonious. Ramaphosa has turned down several of Moyane’s demands, including a request that the state cover Moyane's legal costs. Moyane's team has accused Judge O'Regan of having a conflict of interest owing to her role in Corruption Watch. 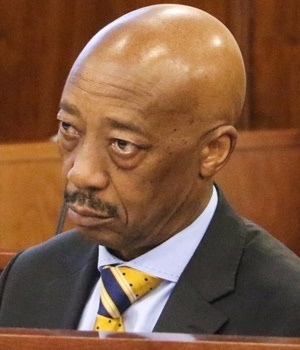 The civil society organisation said in March that it would pursue a private prosecution case against Moyane if the National Prosecuting Authority failed to act. Moyane was suspended on March 19 in a letter by Ramaphosa, who accused him of contributing to the “deterioration in public confidence at SARS and public finances being compromised”. Executive Director at Corruption Watch David Lewis told Fin24 on Friday the organisation is not commenting on the issue.